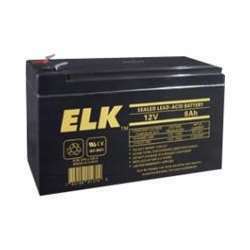 The Elk-1280 is a 12V, 8AH, Sealed Lead Acid Battery with .187" F1 Faston terminals. The Elk-1280 is leak proof, fully rechargeable, and great for powering emergency lights, exit signs, and uninterrupted power supplies. The Elk 1280 is a highly versatile and maintenance free solution for anyone looking for a reliable backup power supply for Access Control Systems, Fire Alarm Systems, and Security Systems. I ordered one of these off of J MAcs website (I was getting a Low-battery indicator on my panel). I found the right one very easily. They had it in stock and it qualified for free shipping as well. I received my battery about 2 days later and had J Mac walk me through the process of switching it with my old battery (which is really easy, by the way). I just wanted tocome back here and thank you guys for a job well done and let other people know how really great you are. Thank you. Jmac was great. I needed this part in a hurry. I found it on this site w/ free shipping too boot. you know the saying: if it's free, it's me.. lol. Thanks guys!